Some of you may (or may not) know, I'm a little obsessed with stationery. This goes right back to when I was a kid on my way to my first trip into town with a friend without adults at 11 years old. What did I come back with? A pencil sharpener and a rubber. Random but true. Then, each trip after that, I came back with pretty much the same things, until I got a little more adventurous with my money and began purchasing pens and notebooks. I was the one at school with the fluffy pencil cases and huge Minnie mouse pens that I'd buy when I went to Florida. All my friends were envious, obviously, wouldn't you be? So when the lovely people at Viking Direct let me loose on their website I couldn't say no, obviously. I have to admit, when I fancy some stationery, the internet isn't the first place I think to go. Viking Direct is part of Office Depot, and is the biggest selling company for office products in the world. It sells a huge variety of well-priced items from your typical stationery to office furniture for homes and business', to office essentials such as coffee machines and biscuits! (Unfortunately we don't have biscuits on tap in our office, although its probably more 'fortunately' for me!). My first impressions of the website were that they were aimed purely for businesses so that must mean their stationery is pretty 'professional' and probably wouldn't cater for me and my 'pretty stationery' needs, however I was wrong! I chose this acrylic pen pot to pop all my pens in as I thought it'd be helpful to see which pens you're choosing. 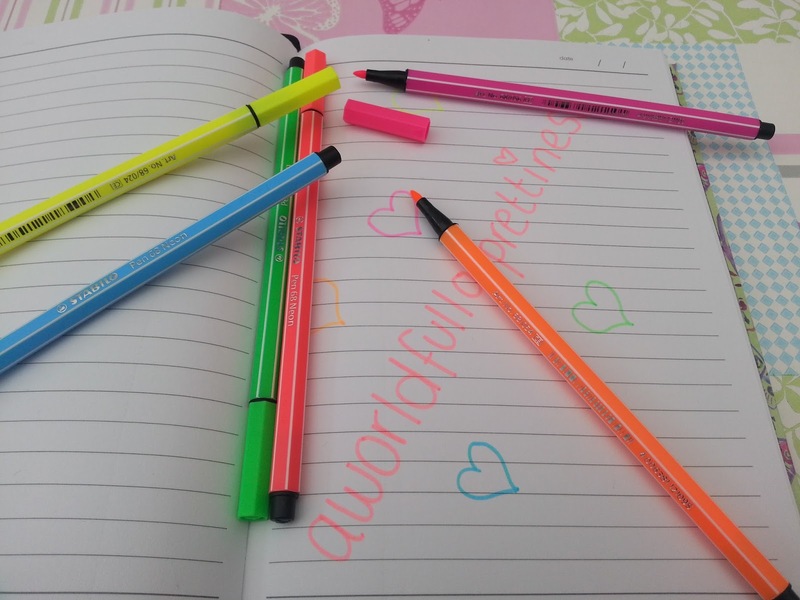 Plus, with all the pretty pens I have, I thought it'd be nice to have them on show instead of hidden away! 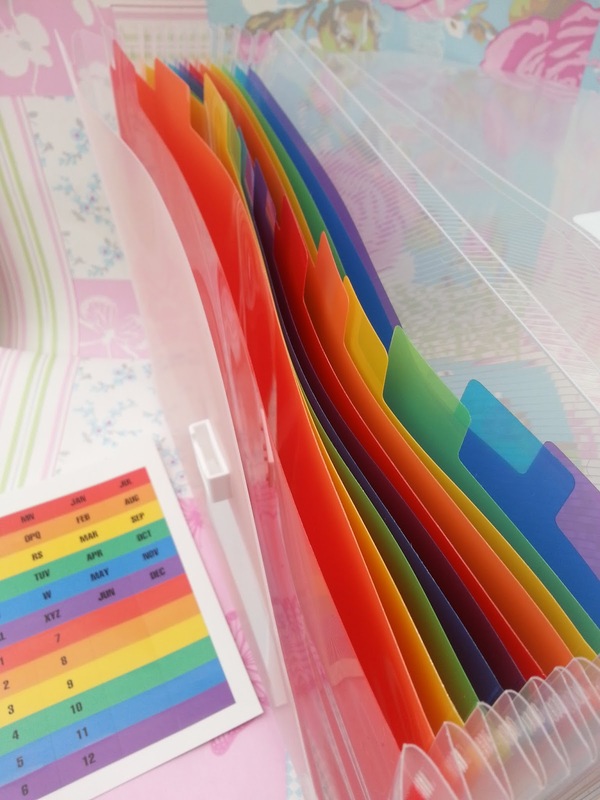 There's quite a few acrylic items to choose from that could be used for other items besides stationary! (I know acrylic storage is pretty popular with girls and their make-up!). These post-it notes are fab. The amount of times I've bought post-it notes and the stickiness of them is poor. I bought these large ones as I'm forever leaving notes for Mike around the house (mainly to remind him to do errands!) so with how bright and sticky these are, he definitely wont miss them from now on! They're also good memos for me in my study area. There's times in your life when you need a highlighter. I don't use them as much as I did when I was at university, but they are still nice to have 'just in case'. 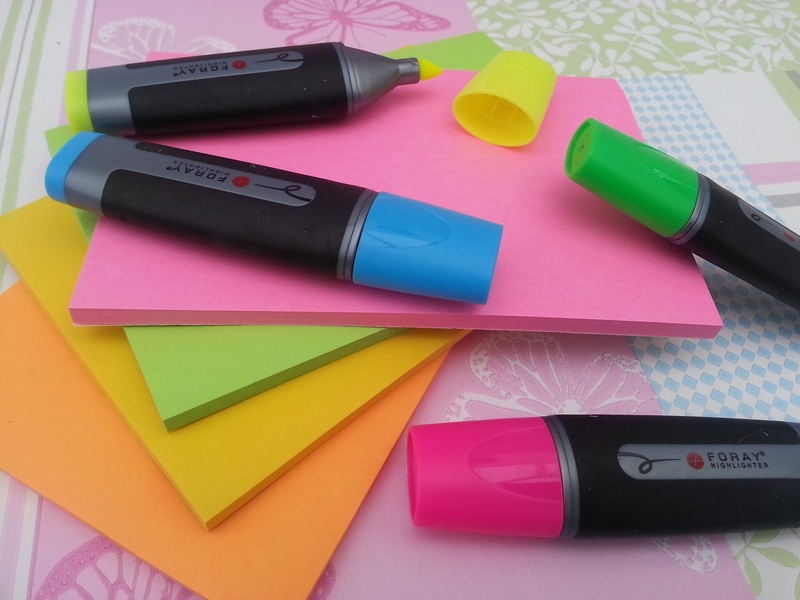 These highlighters were a steal at just 99p! They're really good quality too! These border rolls were my strangest buy. I actually thought they were going to be sticky (a bit like washi tape, but on a larger scale). I was wrong. 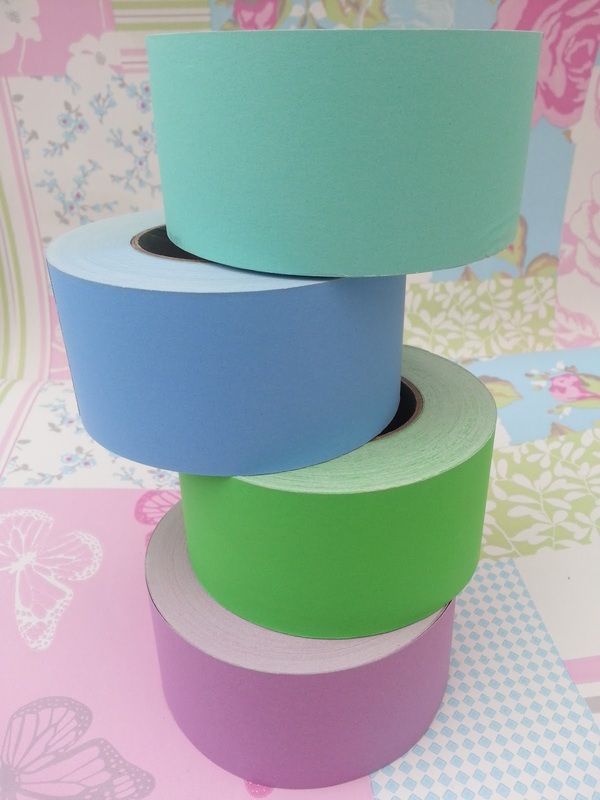 They are just reels of coloured paper, however I'm sure I'll be able to make some sort of ceiling decoration out of these for in the conservatory and fill it with pastel goodness when we have BBQ's in the summer. I already have a few ideas up my sleeve. Mandatory item on a stationary shopping list - A notebook! 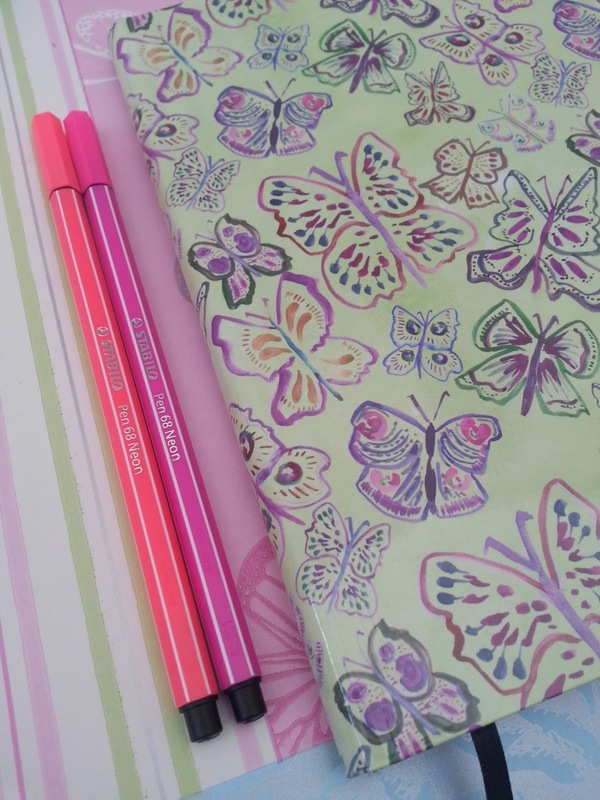 This pretty butterfly notebook is perfect - the design is cute and it has a plastic wipe-down casing on it which helps it from getting grubby in your bag! It can also be used as a diary as there is a space at the top for a date. Every household needs at least one of these expanding files to add organization to all their bills and bank info. We slowly fill more and more of these up as the years go on. However I might keep this for more personal use and maybe use it for blogging in some way? Who knows. I was really impressed with Viking's customer service and delivery. I ordered my items one evening and they arrived less than 48hrs later. Delivery is free on orders over £30 which is pretty easy to achieve on that site! Keep your eyes peeled for my next home interior blog post where you can see all these items in their new home in my new shabby chic study area! N.B - For those that have been asleep for the past week, I have a giveaway open on my blog to win a bottle of Bioderma (the stuff that all beauty bloggers have raved about!). Its come all the way from Paris (where it originates) and I have 2 up for grabs, so go and enter here! 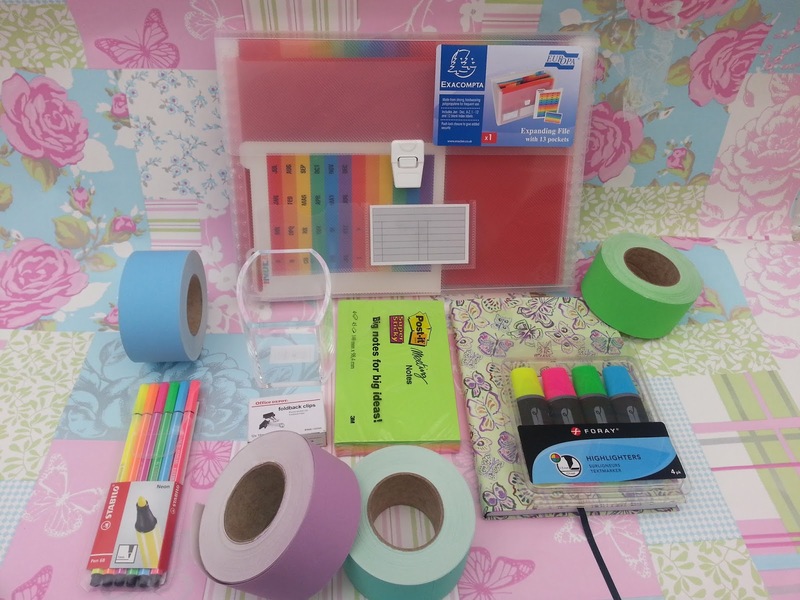 I love stationery too! It's a love that has come from my mum. I find it satisfying when I can write in a new notepad at Uni - the little things !! I was given the pleasure of being let loose on their website too, hey have some lovely things and their notebooks are all adorable. I was also the girl who was obsessed with stationary. 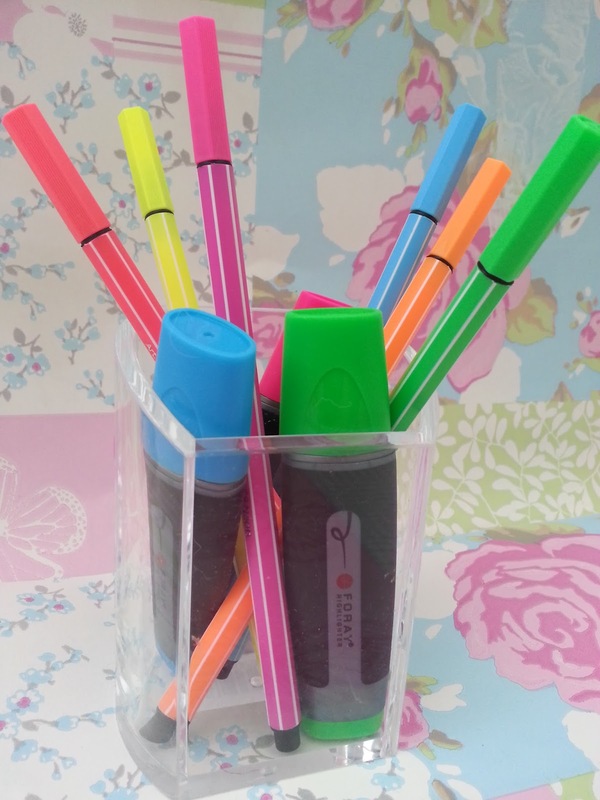 I loved stationary box and I loved the start of the school year when I was allowed all new pens and tipex and rubbers! I remember going on school trips and getting rubbers or those pens that have the colours in them like crayons, then you push the top out and put it in the bottom to change the colours? I don't think I explained that well! Ooo.. have you done a post on your items yet? Intrigued to know what you picked!